G.P. Putnam's Sons, 9780399167324, 432pp. Juan Cabrillo and the crew of the Oregon find themselves exposed when a brilliant scientist blows their cover in this adventure in the #1 New York Times-bestselling series. In 1902, the volcano Mt. Pelee erupts on the island of Martinique, wiping out an entire city of thirty thousand--and sinking a ship carrying a German scientist on the verge of an astonishing breakthrough. More than a century later, Juan Cabrillo will have to deal with that scientist's legacy. During a covert operation, Cabrillo and the crew meticulously fake the sinking of the Oregon--but when an unknown adversary tracks them down despite their planning and attempts to assassinate them, Cabrillo and his team struggle to fight back against an enemy who seems to be able to anticipate their every move. They discover that a traitorous American weapons designer has completed the German scientist's work, and now wields extraordinary power, sending the Oregon on a race against time to stop an attack that could lead to one man ruling over the largest empire the world has ever known. Clive Cussler is the author or coauthor of over fifty previous books in five bestselling series, including Dirk Pitt(R), NUMA(R) Files, Oregon(R) Files, Isaac Bell, and Sam and Remi Fargo. 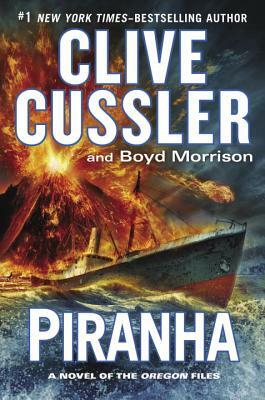 His nonfiction works include Built for Adventure The Classic Automobiles of Clive Cussler and Dirk Pitt, and Built to Thrill: More Classic Automobiles from Clive Cussler and Dirk Pitt, plus The Sea Hunters and The Sea Hunters II; these describe the true adventures of the real NUMA, which, led by Cussler, searches for lost ships of historic significance. With his crew of volunteers, Cussler has discovered more than sixty ships, including the long-lost Confederate ship Hunley. He lives in Colorado and Arizona. Boyd Morrison is the author of six adventures, most recently The Roswell Conspiracy and The Loch Ness Legacy. He is also an actor, engineer, and Jeopardy! champion. Morrison lives in Seattle.